What has been taking place in Syria for the last 7 years “is another July war with the same objectives” and “soon we will emerge victorious from this major war in our region.” With these words, Hezbollah’s Secretary General His Eminence Sayyed Hassan Nasrallah summed up the substance of the conflict, linking the July War to the war raging in the region, especially the Syrian conflict. This linkage is sufficient when reflecting about the magnitude of the stakes laid out by the planners during the July 2006 war. The stakes were no smaller than those in the Syrian war. But the “Israeli” failure in 2006 was a prelude to the failure of the largest American project in the region with the Syrian war today being one of its consequences. 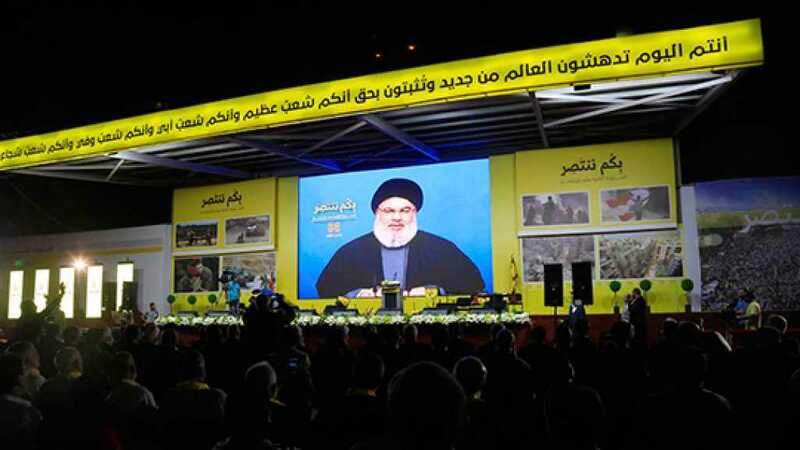 On Wednesday, Sayyed Nasrallah redrew the successful equations of the axis of resistance, placing them within their precise content and in their strategic context. Sayyed started from the accumulating number of victories by this axis, including the victory in August 2006. But it was within the context of past and ongoing victories. Sayyed intentionally put matters into a context in which the equations are linked, showing the strengths that the resistance enjoys today. What are the highlights of these points? And why should things be based on them? First: Tel Aviv failed to build a security belt on the Palestinian border along the Golan Heights. This means Tel Aviv did not emerge with any victories, even a direct geo-military victory. This situation is worse for the entity than it was before the war on Syria. Second: the American project and the “Israeli” army lost all their strategic gambles as a result of the war in Syria, including betting on political allies to betting on terrorist groups militarily. This resulted in new political and military equations. Third: the enemy picks options against regional players, depending on their weakness while at the same time recognizing the decline of their own strength. This can be added to the accumulated failures of the enemies, which are demonstrated by targeting civilians in the war on Yemen, attempting to impose the deal of the century and fabricating an economic war against the Islamic Republic of Iran. Four: The strength of the axis of resistance in the battle was always steadfastness, regardless of the nature of the battle (soft or actual war), which contributed to the victories in Lebanon, Syria, Iraq and Yemen. This is what the enemy lacks. And because this axis won in previous battles, it will inevitably win in the current battle. These are some of the strengths Sayyed highlighted. So, how can they be linked to the reality of the current conflict? There is no doubt that the current reality is fraught with challenges that are often the most prominent concerns. But to read the reality accurately, there is a need to highlight the positive variables, their content within the conflict and their strategic impact on it. Yesterday, Sayyed laid the groundwork for this, putting the axis of resistance on the path that will inevitably end with victory. Why? First, the war in Syria formed the ideal model for military, political and security cooperation between Washington and its Western and Arab allies. The West’s plan links this crowd with betting on results and the ability to dedicate international strategic equations in favor of the Western project of hegemony and restoring it after its failed wars. Thus, the result was that this model also failed, which is ideal. Second, the defeat has become engraved in the minds of the “Israelis” as well as those in Washington and the West. The way “Israeli” army leaders and officials speak today about the reality of the current conflict recognizes the failure and defeat after the July 2006 war. Western intellectuals and thinkers who focus on a world of post Western hegemony agree with them. Thirdly, the region is faced with a new reality in which other non-circumstantial equations are drawn. They are structural equations the effects of which will stretch into the coming years. The influence of present-day Russia did not exist before the Syrian war. For its part, the Islamic Republic of Iran oversees regional policies as a new godfather that understands the scope of the balances and interests of the parties. The gradual implications of the new regional and international balances are crystallizing. Thus, the economic war on Iran comes within this context, while the economic war on Turkey is directly related to accounts of economic geography. Between the present and the future, Sayyed Nasrallah yesterday drew the power equations that have become the centerpiece of the resistance. His speech linked the history of victories with the current realities and charted future paths. Sayyed wanted to produce new material for the media that transcends the political characterization and focuses on the practical effects of the equations. Sayyed wanted the world to know that the reality of strength has become a fact!